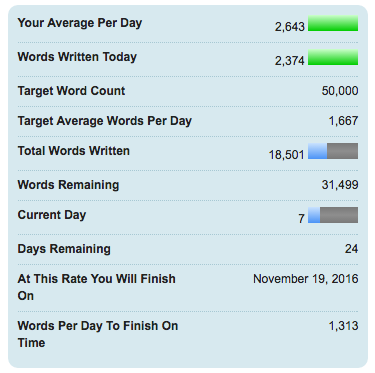 As you probably all know by now, I'm taking part in the NaNoWriMo challenge this month. Find me at http://nanowrimo.org/participants/jolinsdell and add me as a writing buddy ;) Read the synopsis for my book here: http://www.jolinsdell.com/2016/10/nanowrimo2016-do-you-like-me.html. Today is day 7, and so marks the end of the first week of the challenge. So far it's going really well. As you can see I'm a fair bit ahead of the required daily goal. I'm hoping to fit in another couple of word sprints today too in the hopes of reaching 20K. One thing that is definitely helping is that I did scene outlines before the challenge started. I actually did finished these the night before the event started so don't go thinking I did major plotting in advance. I didn't. What I did do though was break my plot idea down into scenes, and make a few notes about what needed to happen in each scene. This is the first time I've done this for NaNoWriMo, and I honestly say it makes a huge difference. Knowing what needs to happen means I can just write it without having to think about too much. This doesn't mean I can't be flexible. My characters took over yesterday and I ended up adding in a scene that wasn't in my original plan. What it does mean is that I know the story arc and so, even, when I get taken on little diversions, I know what I need to work back to. Second is word sprints. I'm a busy person. I never have a whole day to just sit and write. It's just not going to happen. This is why I love word sprints. Quick little 10 or 15 minute shots of writing frenzy. Seriously, they do wonders to boost up your daily word count. Another one of my favourite word sprints this year is the 1K30 where the goal is to write 1K words in 30 minutes. I don't always manage it but can usually get out a good 800-900 words in that time. A lot of what I've written is dialogue. I find it's faster to write than descriptions about setting etc... I can go back and add that in later during the revision process. 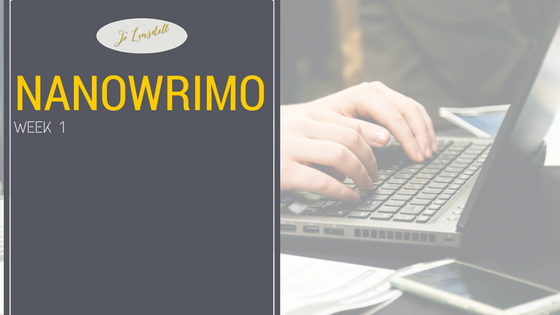 The goal is month is to write the first draft. This mean getting the story down. It doesn't have to be perfect (and trust me when I say mine is far from it), it just needs to be written. Dialogue is also a great way of revealing things about characters. Whether it's them talking, or others talking about them. I'm really pleased with how the challenge it going so far and hope to hit 50K early so I can then switch over to my non fiction manuscript and get that finished this month too. 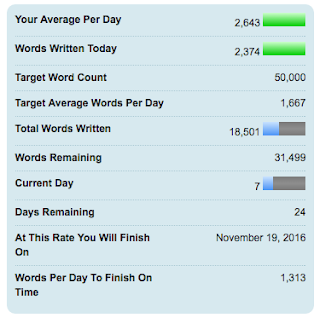 I'd also like to point out that although I'm ahead, this is the first time I've done NaNoWriMo and been this far ahead. Slow and steady can win the race too, so don't compare yourself of others who have written more than you. NaNoWriMo is really a personal challenge. It's just you against your word count. Not you against other writers. Just keep writing. Whatever your progress, you're closer to finishing your novel than you were at the start of the month.